Poolish: a yeasted batter that hangs around for about 12 hours. Then gets added to a bread dough and turned into bread. Why? You use less yeast overall and in theory get more flavour in your bread. Here are some baguettes made with a poolish today. Yes, I know we had baguettes already this week, but these are different. And, more importantly I was trying out Nils’ technique of keeping the slashes very wet during the first part of the bake. They definitely opened up a bit more than they usually do, but the first lot were a bit flat because I kept opening and closing the oven door. The second lot I just sprayed twice all over once they had gone in the oven, rather than painting the slashes individually. Well, all that extra water did something! Make a poolish with 150 grams of water, 150 grams of bread flour, and a pinch (1/8 tsp) of active instant yeast. Mix it up and leave it for 12 hours. Then add the poolish to 150 grams of water, 300 grams of flour, 10 grams of salt and a 1/2 tsp of active instant yeast. Mix and knead well. It’s a loose soft dough which benefits from being folded a couple of times. This will make three thin baguettes, or two bigger ones. Leave to bulk prove for anything up to three hours, depending on time and how active your dough looks, it might have doubled much sooner than that. Then shape into whatever shape you like, leave for another hour or so, heat your oven up to 240 C. If you are making baguettes like these, they take about 18 minutes on a baking stone. If you want to experiment with Nils’s technique you can read about it on his blog. He has got some amazing results, see here. But then, he is an amazing baker! This entry was posted in Bread, Mellow Bakers and tagged baguettes, Bread, Jeffrey Hamelman Bread, Mellow Bakers, nils, poolish, the inverse cook on 16/07/2010 by Joanna. I think that’s the best bread I’ve made. When it comes together it’s wonderful. Interesting about those forced split slashes. Next time I’ll have to take the time to wet the gaps too. It’s the little things that make all the difference in this bread business, isn’t it. – had a look for green pea flour just now. Is it split pea (as in mushy peas) or is it mung bean flour you’re thinking of? Not an easy one I think to find…. I love mushrooms (fungus) and blue cheese (mold) and bread- but I don’t think I’d be looking for a blog entitled Fungus ANYTHING! It just doesn’t sound appealing. BUT- your bread looks really yummy. I often save a chunk of dough from my french bread and let it ferment in the fridge for a day or so and then add to a fresh batch- it adds so much flavor and texture. And it gives the yeast mix an added oomph- we just call it a starter. No- I haven’t tried it but it sounds like something I’d have a go at. I bake much more often in the fall and winter- and much heavier and complex breads then. Summer is just too hot and lazy for me to get into a full baking schedule. Sourdough and its ever clamoring demand to be used is about as complicated as I get- add a couple of cornbreads and Indian puddings and some whole wheat and the occasional French baguette and yeasty Italian rolls and that is all I do in hot weather. I have been baking bread for a long time- but I don’t do it very scientifically. Sometimes when I read yours and other baker’s blogs, I feel entirely out of my league. It is interesting and I have picked up some great techniques and ideas. It is kind of funny- most people who bake bread at home in my area use bread machines and think they are artisans because their breads are home baked. I have never used a bread machine (nor do I want to) and they consider me an anachronism. I’m not sure where I belong in the bread baking arena. However- I really enjoy seeing and trying your breads, and recipes. I don’t think there is anything particularly scientific about my bread making either Heidiannie, I have tried the last couple of weeks to be ‘scientific’ with these french breads, and to my eyes, not managed (no big deal) and realised that it is a bit futile to try at home! Science proceeds by doing replicable experiments, with controlled variables as far as I understand that branch of human endeavour. For example, I start by mixing up two batches of ‘the same dough’ and differences creep in from the start. I can’t weigh to the accuracy of single grams, I certainly can’t measure out an 1/8th or a 16/th of a tsp of yeast… the temperatures go up and down, the oven temperature, the times vary, the mixing. I think the science part is a lost cause as far as I’m concerned…. I suspected it probably was, but the last couple of bakes have confirmed it for me. This blog was started because I wanted company baking. It was prompted by the way the Mellow Bakers group is set up, which encourages you to blog what you are doing. It’s a nice group of gentle souls and it’s been great the first three months, anyone can join in at any time, bake a little, chat a little, drop in and drop out again and I think we are learning a lot from each other. Celia encouraged me to start up too! So I think, and I really mean this, you are totally in the league! Anyone can be, what’s the big deal after all? It’s just bread and your shaping skills and creativity are far beyond anything I can do. People start baking every day and are astonished and amazed at what they can achieve, one of the many reasons it’s such fun. I don’t have a bread machine but they are very popular here too. Indian pudding is a very wet and slightly sweet white corn pudding. The cornmeal is a white meal with reddish tint- you can see it here -in the middle of the post. It makes a nice breakfast or dessert with extra cream- part of the Southern heritage of American cookery. 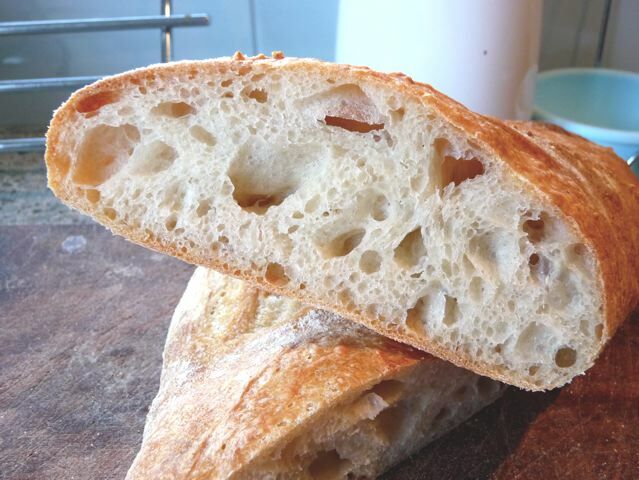 The crumb shot looks gorgeous–wonderful texture and holes. Most French bread isn’t my favorite, but I should really try one of the poolish versions, since I tend to like bread made from wetter doughs. 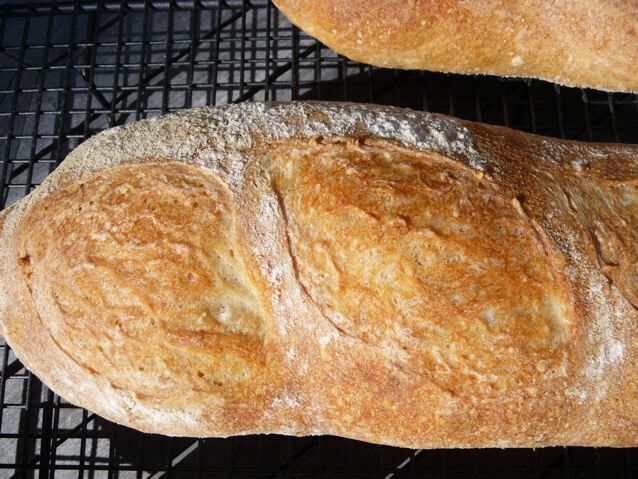 DI, if you are happy with wet doughs then use your sourdough, baguettes are just bread in a different shape at the end of the day, lots of crust to crumb. I think the one that gives most flavour is the one made with old dough (paté fermentée) if you are using yeast and next time I make them I’m going to add a little wholegrain flour of some kind, rye, wheat, just something to give more depth of flavour. The poolish is a comparatively recent invention according to Mr Hamelman. Joanna, I just wanted to say how much I love your blog. All the bread details that you go in to- I really enjoy. Even though I might not be making it myself, I love reading how you made it… and Fungus Breath- I don’t know its kinda catchy. Thanks so much Brydie! Glad you like the blog, it’s been fun doing it so far. Did you ever see Raymond Briggs’s book Fungus the Bogeyman? I have a copy somewhere in my pop up book collection. Maybe that’s what prompted that thought, and the one about why they never show Quorn being made…. Now I had to look up Quorn- lordy…fascinating! Made from soil mould- thats amazing. Apparently its only been available in Australia in June this year. Truly amazing. I haven’t seen that book before, but I think Monkey Boy would love it. We have another one called The Terrible Wild Grey Hairy Thing- a forgotten sausage that grows bigger bigger with mould and harasses the town folk- gorgeous pictures… (I am a bit of a kids picture book fan). I don’t think you are missing that much, spaceship food I call it ! Located with processed meats in the supermarkets…. You are too kind as always (blushes, takes small bow) :) How far has kitchen progressed? Now if only I’d read this before leaving uninformed comments on Celia’s blog! Sneak onto any of the bread forums and read what people write, try the Fresh Loaf, or Sourdough.com or Mellow Bakers, all full of people puzzling over other people’s baking words and how to translate and interpret them. I just repeat and recast the stuff that sounds most plausible to me. You know how English is full of words that either duplicate each other or are used in different contexts, on account of our history of being invaded endlessly, Romans, Anglo-Saxons, Normans, so we get Latin, German roots, French roots, a bit of Greek here, a little Inuit there, and then when not invasion, immigration, my forebears amongst them, travelling, taking their foods and their customs with them – a constant flux of language and terminology and now the net. It makes my head spin sometimes. Once again, J leads the way! Great going with the water – now I have to try that. Here I thought I was done with those darn baguettes! Oh no, definitely not leading, this was all Nils’s experiments, I am just a Nils acolyte….